And so it continues. The banker in Dead Dog hits it off with Cable because of their shared distrust of religion. The railings of a tent-preacher against the evil of machines reminds Cable of the possibly-treacherous preacher to whom he entrusted his land claim. In case you didnâ€™t think Sam Peckinpah had a heart, I commend to you The Ballad of Cable Hogue, Peckinpahâ€™s avowed personal favorite of all of his films. Iâ€™ve been commending it to people for the past 40 yearsâ€”like Rev. Sloane commending Cable Hogueâ€™s soul to an unresponsive God. For my own part, The Wild Bunch is Peckinpahâ€™s greatest film and quite possibly the greatest film; but The Ballad of Cable Hogue is unquestionably my second-favorite Peckinpah film. â€œBut itâ€™s a musical!â€ squeals one of my friends. Well, if it is, so are Rio Bravo and McCabe & Mrs. Miller. But even if it is, so what? The singing is mostly diegetic, but not the gratuitous production numbers of the musical genre. The first burst of song comes from the treacherous Taggart and Bowen, who taunt Hogue with sing-song as they leave him waterless in the impacable desert. The Rev. Sloane sings a few notes of â€œWait for Me, Sunrise,â€ but that song, and the filmâ€™s key song â€œTomorrow Is the Song I Sing,â€ are principally part of the filmâ€™s nondiegetic score. 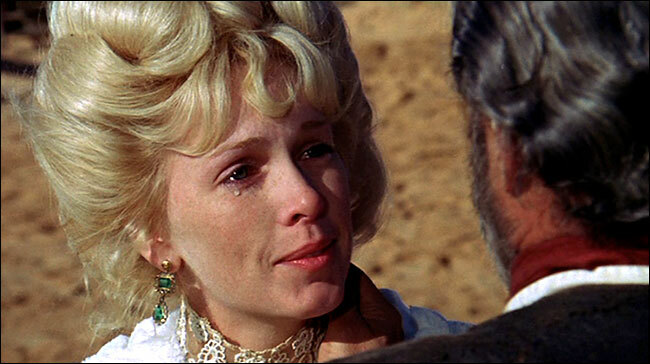 An unseen choir intones â€œShall We Gather at the Riverâ€ during the comic bombardment precipitated by Cableâ€™s non-paying departure from Hildyâ€™s cribâ€”Peckinpah sending up not only Ford but his own The Wild Bunch. Cable and Preacher sing a few bars of â€œCanâ€™t Go Back to Memphis Anymoreâ€ as they set out to raise hell in Dead Dog. Cable and Hildy sing â€œButterfly Morningsâ€ through one of the filmâ€™s several gorgeous â€œtime passesâ€ montage sequences. Jerry Goldsmithâ€™s scoreâ€”recalling his earlier sortie into down-home rural America, the criminally unavailable Lilies of the Fieldâ€”imparts a folksy, genuine intimacy to the film. None of this amounts to anything remotely classifiableâ€”let alone dismissableâ€”as â€œa musical.â€ Indeed, much of the filmâ€™s glory is that it mixes elements of the musical, the comedy, the love story, and the western, to tell a tale Peckinpah desperately wanted to tell, the like of which no one has told before or since. The traditional western is backward-looking, loaded with nostalgia and loss for what is passing or past. The Ballad of Cable Hogue looks toward tomorrow. The filmâ€™s eyes are on sunrise, not sunset; on mornings rather than evenings. The songs stress this as much as Peckinpahâ€™s mise-en-scene: â€œTomorrow is the song I singâ€ â€¦ â€œWait for me, sunrise â€¦ I will see what tomorrow will bringâ€ â€¦ â€œButterfly mornings.â€ Like the great western heroes, Hogue doesnâ€™t survive the transformation he helps bring about. But unlike them, he doesnâ€™t dieâ€”or ride awayâ€”looking back. There are, of course, great westerns that do offer a vista on the futureâ€”The Man Who Shot Liberty Valance and Once upon a Time in the West, to name twoâ€”but their forward gaze is a bleak one, sharply contrasted with the passing days of titanic individualists whose strength and vision made meaningful myth out of the frontier experience. Cable Hogue takes a more active role in transforming the wild land to something as familiar and welcoming as home. Rather than facilitating the development of land and community, he takes a personal hand in it. He builds. In contrast to the anachronistic archetypes of Once upon a Time in the West, he finds out he is a businessman: â€œPeople goinâ€™ somewhere on a roadâ€”and Iâ€™m on it.â€ He pulls a fortune out of a strategically situated waterhole and turns it into what is destined to become the first gas station, rest stop, and roadside attraction on a still desolate northern Arizona highway. The film shares with its contemporaneous cousin McCabe & Mrs. Miller an elegiac glimpse of the American Dream lost almost as soon as it is grasped. But Altmanâ€™s film is dominated by a dim view of Americaâ€™s corporate future, reiterating the westernâ€™s perennial theme of big capital squeezing out the little-guy entrepreneur, leaving no middle tier between the wage slave and the corporate fat cat. Cable Hogue, unlike John McCabe, gets his piece and gets out before the buy-out, facing even his own death with an indomitable optimism. The Ballad of Cable Hogue does reiterate the key elements of the western: the strength and demise of self-sufficient individualism; the frontier becoming community; changes in transportation technology signaling the coming of a faster-paced but less robust way of life; Americaâ€™s manifest destiny; the heroâ€™s personal revenge counterpointing his not-quite-realized social mission; lone men and the impact on them of the absence and presence of women, and the way the feminine principle drives men to achieve without their quite knowing it; the inevitability of transformationâ€”for better or worseâ€”to a new order of economics, morality, and justice. 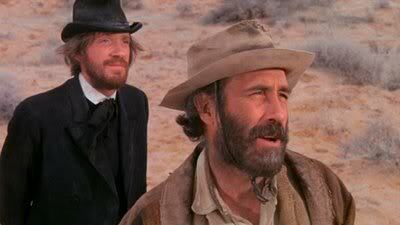 But part of the filmâ€™s triumph is the way in which it reverses many of the standard motifs of the traditional western. Cable doesnâ€™t achieve what he does through superior prowess or near supernatural power, but more by accident. He lets himself be taken advantage of, as no John Wayne icon ever would; but he learns from it as the men of The Wild Bunch fail to do. He stays at home, and it is his woman (if she can be considered anyoneâ€™s woman but her own) who goes off in search of fortune, promising to come back for himâ€”which she does, as the ladiest damn lady you ever saw. He distrusts civilization, but recognizes the necessity of goinâ€™ in amongst â€™em, does well at it, and grows to like the ideaâ€”though his next destination turns out to be neither San Francisco nor New Orleans. Despite its radical difference in tone and outlook from Ride the High Country, Major Dundee, and The Wild Bunch, the film is unmistakably, quintessentially Peckinpah. That much is announced by the opening shot of a Gila monster, recalling the one perched atop the gold in Peckinpahâ€™s beloved Treasure of Sierra Madre, and shortly blown to pieces by Cableâ€™s treacherous partners. Or by Cableâ€™s little dance in the street of Dead Dog, an homage to Treasureâ€™s prospector Howard (Walter Huston), by way of The Wild Bunchâ€™s Freddie Sykes (Edmond Oâ€™Brien). There are a million Peckinpah gestures in the film. Itâ€™s filled with delicious moments. Like the one in which the little guyâ€™s personal successâ€”both financial and sexualâ€”combines with Manifest Destiny when Cable lowers his flag, then quickly raises it again as he sees his beloved Hildy arriving. Or the luminous moment in which Hildy, backlit at dusk by the oil lamps inside Cableâ€™s bedroom, steps to the door in her nightdress, and Cable says, â€œNow thatâ€™s a picture.â€ Hildy says, â€œYou seen it before,â€ and Cable replies, as if in prayer, â€œLady, nobodyâ€™s ever seen it before.â€ Or the chill that descends when Cable unthinkingly reduces love and friendship to financial transactions, asking Rev. Sloane to pay for his meals, and telling Hildy she doesnâ€™t have to â€œbecause you havenâ€™t charged me nothinâ€™,â€ and the Marxist critique of capitalism rears its unwelcome head. Much in the way I urge you to take this film. This is a Peckinpah that nobody ever saw before.